I could almost understand the gibberish sample writing used as spacing, the layout looks great, lesser folks should get half a page. I am in agreement.. Heroes and Professionals, 1 page bios, Henchmen.. just get half page..
Yep that's what I was gonna do. Henchmen are going to be more generic, no character names just more like a class.. like a bandit or a thug or deputy. I was going to arrange those 2 per page with just a picture on one side and the stats on the other. Resin currently does well for chunky things like armoured vehiclesl I imagine it would do well for figurines. What I would love to be able to do eventually, some day, is do everything in house. Sculpt my own minis in Zbrush, print them on my own high res 3D printer, cast my own minis in resin or metal if I could learn how and get the right equipment, and then pack everything up and ship it out. Right now I have to pay someone else for pretty much everything but graphic design, so my costs are a lot higher than I’d like them to be. Can’t really get away from that right now but I hope to one day. Been going through some rules tweaks. I decided to add a rule where the max amount of dice you’re allowed to roll at any time is 6. I was thinking, if you cranked up your ranged combat to 6 when you made your own character, then took 2 pistols, the gunslinger skill and bounty hunter skill… you’d have +3 dice when rolling to hit a human so a total of 9 dice altogether. Just seems too excessive. So I’m hoping in this case, people will be encouraged to spend their points on other attributes rather than min-maxing. If you wanted to be able to roll 6 dice and have those skills, you would just need a ranged combat of 3. At first I was going to have a rule where you can only ever get one +1 D6 bonus and they don’t stack, but I do want people to be able to make some killer combos. But, I may change the hunter skills to give you rerolls for a missed attack rather than +1 D6 to hit every single time. Or maybe +1 strength vs a certain race instead of +1 D6? It's never occured to me that people would push the rules envelope. BWG is one of the most "Spirit of the Rules games I've ever played. There are, I suppose the win at all costs crowd, even in BWG. Yeah it's definitely meant to be a laid back game but I just want to have safeguards in place just in case and I don't think it will hurt anything. So, another thing I'm going to be doing for the 2nd edition is make sure everyone but the minions & henchmen have a gang. So I'm going to do away with Hired Guns and they will all join gangs as members instead. You'll still be allowed to mix up characters like now though. Right now I have John Blackwood, Mickey Finn, The Norwegian and Clinton Wales joining the Clancy Gang. Doc Lloyd, Shamus McFox, Kurt Wyatt and Dr. Kilmer will join the Vigilance Committee. And then Nevada Dave, Marshal Stewart, Father Al and Rooster Moorison will join the Dockside Drifters. After this new batch of minis and new gangs are done I'll be adding more characters to all of the other gangs and the goal will be to get each on up to around 9 characters. Still plugging away at the rulebook. I never thought I would have as much content as there is but I guess over the last 4 years or so I’ve really accumulated a lot of stuff It’s kind of slow going because I have limited after-work time and I’m also spending some of that repainting some of the older minis so I can get some newer looking photos. Once I’m done adding all of the new gang info and stats I’ll put together a preview PDF of the whole thing. Still looks like it’ll be at or over 120 pages and that’s not including campaigns or having lots of different scenarios. So I’ve been thinking about maybe doing special campaign books later on, kind of like how Privateer Press does it for Warmahordes, where each one will add more fluff and new characters & gangs and special scenarios to play. I’ve decided to do 1 more race/faction change.. I was planning to have Undead and Demons as 2 separate races, but since they are both evil and both want to eat people I figured they would be better off merged together. In the fluff it will be described as evil spirits & forces that can possess living or dead hosts. So now I was going to name the factions Mortal for humans, Savage for all skinwalkers and animal types, and Corrupt for all undead and creepy things. And that will work out perfect for the 3 new gangs in the Kickstarter, we’ll have 1 of each. Spending the weekend writing background about El Jefe; Chief Bloodwolf; Wilt Clancy and all the other Leaders of the notorious gangs of Blackwater Gulch. I'm working with a Buffalo soldier Gang; I picked up a couple of Artizan packs... I'm working on a good trooper vs Bad trooper scenario thing involving Wilde's Rangers vs my yet un-named Buffalo Gang. Just some monday morning ramblings. I’ve been thinking about the 2nd edition boxed set some more. I still haven’t gotten my quote from Panda yet (they said 3-4 weeks and it’s only been 2ish). If I do a boxed set with a rulebook + cards and dice and all, I kind of feel like it needs miniatures too and it should be more like a 2 player starter set. The problem is, they would have to be PVC minis and I’m not sure I like that idea. PVC has gotten better over the last few years but the details still aren’t as good as resin or metal. But for a box set the minimum I need to print is 1500 copies, so when you get to that many copies resin and metal is just too expensive. So just wondering what you guys might think of that idea.. a 2 player box set with PVC minis for 2 different gangs (probably Unsung & The Wicked), and all other gang sets would be metal. Honestly the main reason I keep thinking about the boxed set is because of Kickstarter. It seems like with minis lately you need to go big or go home. Big boxed games seem to have much better chances for success. Not really expecting to be able to pull in anywhere near 6 digits, but just based on the quotes I had for the Bad Lands game before, I don’t think the funding goal would be too bad.. probably just in the $25-30k range. I think that’s do-able if we can get the right amount of attention when it launches and I already have a bunch of ads reserved for sites like beasts of war and tabletop gaming news, so I’m hopeful. So just wondering, what do you guys think of that idea? Whatever medium you choose to make the miniatures in, make them exclusive to the set or at least have an exclusive miniature from each faction in the set. Cardboard buildings might be something to look into. Just bouncing the idea around in my head, but with the current rulebook & cards I'm working on now, I really wouldn't need to add much more to the printed stuff other than a nice box. So the box set would come with the rules, loot cards, character cards, special dice and a punchboard sheet with tokens and small ruler.. I can fit a 12" ruler diagonally on a 8.5x11 sheet. I already have plenty of token art made up from the old Bad Lands project. Adding in minis I thought I would just include The Wicked and the Unsung starting with 5 per side. For stretch goals, I'd add 2 free mins to the set, 1 for each gang. That would go up to 18 total or 9 per side. That would crank up the retail price a bit, but not change the KS price, so it will be a better deal the more we unlock. For other goals, I could include either board tiles or a fold-out matt with some tuck box buildings similar to the starter sets for Infinity. The buildings would be more like obstacles though, you wouldn't be able to go inside them. We could also add in plastic objective markers and/or obstacles & scatter terrain as stretch goals. Also I would still do the Wormwood Wardens and add them in as a 3rd gang expansion pack after the main box set is all unlocked. But as far as buildings go though, I do have a sculptor working on my first building kit right now, it'll be resin and have lots of detail like deep wood grains for drybrushing fun. I'm starting with a small 4x4" 1 story shop. Once we get that done, we can pick it apart and make different larger versions and multi-story buildings too. I wasn't sure if I want to add that to the campaign though because I don't know what the prices will be like or how long it will take to make on top of everything else. So it's a separate experimental project right now. I would consider the third gang as an add-on to put up is funding stalls or when you have a number of backers where if half of those backers bought the add-on the funding for the add-on would be met. Maybe make that building an add-on too. Yeah, I could probably add the building in, and I want to get the 3rd gang going too. I just want to be careful and not offer tons of stretch goals to the point where it goes on and on and takes forever to fulfill. I wanted to stick to a finite amount, I'd rather do a couple of smaller campaigns and launch a new one when the last one ships rather than having multiple waves of stuff. I could probably offer a bundle with the box set + 2 or 3 buildings. I was also going to include all of the original gangs for add on items too. people could just buy them from my online store, but if they add it to a pledge they will get the updated character cards with them. Run the numbers and do what makes sense. As I know you planned on anyway! Yeah. it’s tough when there’s so many options. The only thing they all have in common is they’re all expensive. I was just thinking now, since it’s a skirmish game and all, and a 2-player starter set like Infinity or Privateer does, I probably don’t need PVC minis since it’s not a real board game. I need to produce 1500 copies though, but I think PVC is best when it’s like 5000 or even more. I doubt I will ever need that many, but I guess you never know till you know. So I’m asking Panda if they can do regular resin instead of PVC. I’m guessing they would have to outsource it, but they probably outsource the PVC too. Resin minis would be more detailed and I can still stick to the same 30mm bases I’ve been using for metal minis. Not a big fan of integrated bases. Or, if that’s all ends up too pricey I would just stick to the rules & cards in the box and separate metal starter sets. Twisted did that and it seemed to work well. Their minis were a bit pricier though since their sets had 7 minis. I paid $140 USD for their rules box + 2 gang sets, 14 minis in all. Another thing on my mind.. last time my campaign failed but I had so many store sales during the campaign that I made enough to fund the minis anyway. It would have been successful if those sales were pledges instead. So I’m wondering if I should shut down my online store during the campaign? Folks that want the old minis can pledge for them, and they could be shipped out as soon as the pledge manager is done if they don’t want any new items. That way those dollars will help to fund the campaign. I’ve been wanting to rebuild my online store from scratch under my main URL anyway so maybe now is the time? Those loot cards look nice. Can't wait to get some of those. More Monday Morning Musings .. this is turing into a habit. So, I’m still waiting for the prices for the boxed version of the rules, hopefully will have them this week. 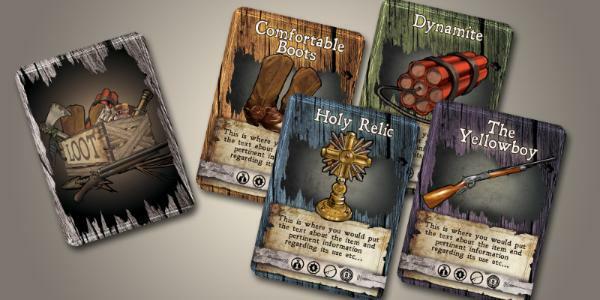 That will come with the rules, character cards for all old minis, loot cards and fancy dice. I’ve been wondering if it might be better to have smaller rulebook in there instead of full sized, basically removing all of the character bios that take up half of the book.. that would make it around 60 pages rather than 120, I’m not sure how much of a price difference that will be. I had a quote for an 80 page and 120 page single rulebook before, and it was a difference of around $10 for the retail price. So that got me thinking.. since my starter sets are going to be around 6x4” boxes, I could include a small booklet inside each one talking about each gang.. it would be kind of like the little booklets you get in a DVD or music CD. They wouldn’t really drive up the cost much, they would only cost me around 10-15 cents if I print 500 or more. There will also be character stat cards in the boxes too, so I’m not sure the booklets are needed and maybe cards are good enough? Or instead of the booklet, maybe a big 6x4” bio card for just the gang leader with some nice art on 1 side and his bio on the back? Would it be worth adding stuff like that, or would most people just skim and then toss em? I really want to try and emphasize that it’s a character driven game, not the type of game like Warmachine where you just have 1 character and then bunch of other nameless people. or would it be better to do the smaller rulebook in the box, and offer a bigger fuller rulebook later on after the box set is sold out, and that would contain all of the character bios and stuff? I was wondering if you should include any cards at all; providing cards for all the miniatures seems like a bit of overkill for a starter set. Providing a sheet with faux character cards for the gameset minis might be a more economic option. provide the cardset as an aftermarket option. A full rulebook would then be more viable. but then I'm still kind of on the fence about offering the old minis as add-ons in the new campaign. On 1 hand, it will be nice to get some extra funding dollars from them. On the other, it could lead to some really complex pledges and cause some fulfillment nightmares and it might be more streamlined and focused to stick to just new stuff. I will eventually be repackaging the old minis with new cards and boxes, but printing the boxes will be expensive so I probably won't do that until after the campaign is all done. So that's kind of why I wanted to include the new cards in the box set. I have a feeling I’m going to have to ditch the boxed ruleset idea and stick to the hardback rulebook. Got 1 quote and still waiting for more, but it looks like it’s going to be too expensive and would only be worthwhile if I was ordering like 5000 copies or more .. and i know I won’t need anywhere near that. I was planning on the minimum of 1000. That alone will end up costing over $17k after shipping & KS fees. The hardback rulebooks will be much more reasonable and probably the best bet in the long run anyway.. they’re printed here in the US.. texas to be exact. So unless another printer gets back to me with some amazing price, I’m gonna keep planning on the hardback book + separate pack of loot cards. Looking over the rulebook, quickly, I did notice an error on the Map, It said "GOLDRCOK".... but that may or may not be fixable. I understand why you have Artillery as immobile, Though as an Artillerist I know they can be quite mobile. I propose that two men could move it two inches; three-three; a maximum of four inches for four. this would include a pivot either at the begining or at the end of the movement. This balances the impractical with a hint of desperation, but a movement could be a gamechanger.... naturally the weapon could not be moved and fired in the same turn. That's the issue; Naturally you want to keep the game simple. Reality can complicate things...A mountain Howitzer would be a wonderful addition, but the inherit difficulties of translating the complexities of the processes of muzzleloading Artillery could just about overload the patience of the average gamer. I do really like the fleshing out of the new rulebook. there appears to be an enhanced vision of the Supernatural storyline that provides Raison D'etre to inhuman segments. The rules, naturally can be used historically as well. Yep that’s what I was getting at with the 2 factions. If you prefer more of a historical game, just use human gangs and it’s the same game as before just with the updated rules. If you like monsters, you can play Immortal gangs too. If people really want to get crazy with custom gangs, they can even mix the 2 factions together with skills. I’m also going to be taking the weapon & skill lists and adding them to a “Wild West” supplement for the generic gangfight rules so that will be another option for regular western games too. I still haven’t put the stats together for The Wicked just yet, I was planning to have Miss Lavoe be a demon and make it just an Immortal gang, but I’m thinking about having her be a regular mortal with the Warlock skill.. so they will be the first mixed gang, just with an evil theme. Maybe we can add some really mean mortal outlaws in there too. But I was also thinking of adding a Hellfire Club gang later on that would be like that too. I’m getting things ready for the Kickstarter now. Only 2 weeks away and that’s going to come sooner than I think. I got a bunch of different rulebook boxed set printing quotes so far, and I’m still waiting for 1 more from Ludofact in Germany. I’ve decided to stick to the 120 page hardcover rulebook, and that will come in a box set with a deck of loot cards, 6 custom dice like we’ve done for previous campaigns, and also a sheet of punchboard tokens for things like loot & objective markers or tracking special types of damage like who is on fire or poisoned. The box set will cost $35 regular price or $30 for the KS sweet spot pledge. The gang starter sets will be $25 regular or $20 for the KS.. so the sweet spot pledge will be $90 for the rules and all 3 new gangs, with a $20,000 funding goal. I haven't decided yet if I want to include the old starter sets in the campaign, I kinda think it would be better to focus on the new models and people can just buy the old ones right away if they want them. Right now I’m trying to decide what to include in those 120 pages. My original plan was to have 4-pages devoted to each gang, and another 20 or so pages for all of the hired guns, henchmen and minions. That filled up around 70 pages altogether. What I’m thinking about doing now is only include bios for the new gangs and characters that get added with the campaign, and fill up the rest of the book with the campaign rules and special missions. And on the subject of campaigns, I’m kind of torn. I've always liked the Mordheim/Necromuda style campaign where your characters get tougher after each game, but I feel like custom characters takes away from the theme I’m going for where you’re supposed to use our pre-made characters and everything you need to play is included in the box sets. Lately I’ve been playtesting something more along the lines of an escalation league format. Your gang starts out with 200 Fame and you use that to recruit as many characters as you can, usually around 4. After each game, your gang earns more Fame and you can use that to recruit more members. it also works well with custom gangs too. Your characters don’t gain XP, your gang just gets bigger and bigger. So, I think that’s the campaign format I’d like to go with.. just not sure if I should include that in the book or go with something more like a PDF supplement. Chatted with a few folks and decided to keep the contents of the book as is, with bios & stats for every gang. I still would like to try and include the campaign rules though, and some special scenarios.. what I may do is have that be a stretch goal in the campaign since increasing the page count will also increase the costs. Though if I'm able to print more than 2000 copies the printing costs will drop a lot, so the cost of extra pages might be a wash then. We'll have to see how it goes. Currently there are 4 pages devoted to each gang. 1 intro page, 1 full page bio for the leader, and then the other 4 characters are 2 per page. I would love to be able to expand that and have 1 full page bio for every character in the game, but that would add a good 50 pages, maybe more. And I would have to pay for a lot of extra writing. But I might consider that for a stretch goal too, would be a pretty big goal, but still. That would probably not happen unless I can get all of the minis I had planned all unlocked. I do have a stopping point for the campaign.. if it goes incredibly well, it will max out at 3 starter sets for the 3 new gangs, then 3 3-man booster packs for each gang, and 3 3-man henchmen & minion packs. There will also be a bunch of new hired guns and monsters (monsters are basically hired guns for immortal gangs) that will be bonus minis. I want to have a stopping point so that fulfillment doesn't drag on forever, I'd rather be able to ship the rewards on time if not early, and then jump into another campaign afterwards, rather than one big campaign that goes on and on. Oh and I've added a new special rule .. Dopplegangers. Since there are a finite number of premade characters, I thought this might be a fun way to explain away the fact that both players might end up with some of the same character(s) in their gangs. So, basically, one of them is an imposter and no one knows who the real one is. Since there can be only one, if a character attacks his doppleganger, he will get a bonus of +1D6 to hit. The initial release answers the call of a self-sufficient table-top game an additional book throws more meat on the bones.that are hungry for it. I got my final price quote today, this time from Ludo fact in Germany. It looks like they will only be good for if I need to print like 5000 copies or more, for 1000-2000 copies their price is just too high. So I'm going to stick with WinGo games in China. They've done lots of board games I recognize so I'm sure the quality will be top notch. We may get stuck with a small delay if we can't get everything printed before the Chinese New Year when pretty much the whole country shuts down for a month. But with a June delivery date we should be fine. I'm saying June, but planning for more like April. Here's a peek at the campaign page so far.. still a lot to add. Also, I have tons of stretch goals planned, but I don't know how many I should show? Sometimes I feel like it's tacky to show a huge list if you're nowhere near reaching them yet... so I thought I'd do 2-3 at a time. Oh and yeah, I think campaign supplements would be a cool way to expand things later on, kinda like Warmachine. Thinking we could do a book that focuses on a specific region like the Wormwood Forest or Mictlan Excavations, add lots of art and stories.. 1-2 new gangs and lots of new characters to join the old ones, and lots of special scenarios to play based on the story. Or maybe do those scenarios as something like a story driven campaign where one game effects what happens in the next?